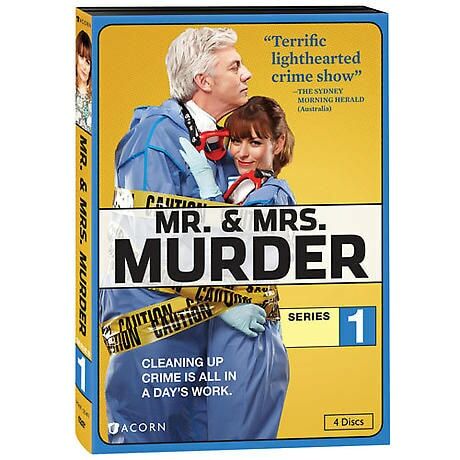 Husband and wife Charlie and Nicola Buchanan are crime-scene cleaners and sleuths in this warm and witty Australian whodunit. Real chemistry between the stars, old-school badinage, and quirky plots draw comparisons to Remington Steel, The Thin Man, and Get Smart. Aussie comedian Shaun Micallef and Kat Stewart star. "Terrific lighthearted crime show" - Sydney Morning Herald. 13 episodes, 10 hrs, 4 DVDs, SDH. The murder of a national hero in a swank hotel looks like an open-and-shut case to the police-but not to Charlie and Nicola. To research their suspicions, they work undercover as hotel guests. Their niece, Jess, has less fun posing as a chambermaid. Cleaning up after a particularly messy death in a luxury home, Charlie and Nicola are horrified to discover that the murder weapon was a dog. A selfish and volatile man, the victim had many enemies with access to dogs. An avant-garde fashion designer is cut down in his moment of triumph. Turns out he cultivated controversy and scandal in the name of art and ambition. Revenge was certainly the motive, but who among the wronged could have pulled off the murder? A young bodybuilder in contention for a national title suffers a horrific death, spurring Charlie and Nicola into action. The suspects include a jealous sibling, a callous competitor, and a desperate promoter. Already beset by accidents and setbacks, a new musical about Amy Winehouse hits bottom when the 27-year-old leading lady is found dead under the stage. The cast and crew believe the production is cursed, but Charlie and Nicola find many possible motives for murder. A lavish wedding is derailed when the best man turns up dead on the bride's family estate. The victim's romantic entanglements and troubled family business give Charlie and Nicola a list of suspects. Detective Vinetti's tie to the family complicates matters. A vet killed by an overdose of horse tranquilizer sets off an investigation at stables that house champion racehorses. It looks like an inside job, and Nicola and Charlie go to dangerous lengths to suss out the truth. A young solo sailor just back from a year-long voyage becomes a murder victim in her home port. A horrifying crime scene and the focus on the sailor's alcoholic father as the prime suspect prompt Nicola to dive deeper and Charlie to find his sea legs. The death of a homeless man in a modern art gallery registers as no more than an inconvenience for the haughty gallery owner and preening artists in the current show. Certain there's a connection between the victim and the art world, Nicola and Charlie begin to draw conclusions. An enclosed beach cabana in a wealthy seaside community houses a grisly surprise for young lovers hoping to use it for a tryst. Investigating the family that owns the cabana, Charlie and Nicola must wade through a morass of secrets and lies. A beautiful young woman obsessed with cosmetic surgery falls from the second story of an esteemed clinic, an apparent suicide. Nicola and Charlie don't buy the theory that she was distraught over the clinic's refusal to give her further treatments. The zoo's big-cat keeper dies by human hand, and the hippo keeper has gone missing. From clues and conversations, coworkers emerge as suspects. The break comes when Charlie gets a chance for some inside investigation during a sleepover safari. Nicola and Charlie find a bloody mess at a restaurant where the celebrity chef has gone missing and is presumed dead. They learn the chef was a cruel dictator in the kitchen, and several employees may have wanted him dead. Rating: NR. Contains sexual references and drug use.